The Provost just sent out a message saying that this year the annual jump (shove??) into Mirror Lake after the “Beat Michigan” rally will be more controlled than usual with only people with official wrist bands allowed into the lake area. For some people (like parents) jumping into Mirror Lake is tough to understand. Mirror Lake is cold and filthy. Plus, the weather tomorrow is supposed to be rotten. Many people who jump in will be cold and miserable after doing it. If you are going to jump in I offer two pieces of advice. First, spend one minute thinking about the small stuff. One of my children went to a semi-organized event, similar to the jump into Mirror Lake. The big difference was that instead of a lake it was a partially frozen river. The organizers promised lots of free hot coffee and hot chocolate (plus beer) to anyone who jumped in. The organizers were true to their word and brought giant containers of very hot drinks. Unfortunately, they forgot about bringing cups so no one was able to drink anything to warm up. One minute of checking for the small but important stuff can be all the difference between having fun tomorrow and not. Second, don’t tell your parents until after you do it. This morning the Dow Jones Industrial Average reached 16,000. Based on this number many news sites proclaimed that the stock market is at a new record high. These stories are both right and wrong. They are right because the Dow has never been at this particular number. They are wrong because the Dow does not take into account inflation. Adjusting for inflation (shown in the graph below) reveals that the Dow is still a small bit below the level it reached in 1999 and it is too soon to break out the celebratory champagne. Have you ever bought an airline ticket and wondered how they really set the price for that ticket? I have been puzzling over this question for years and still don’t have a great answer. The true insanity of airline pricing became clear when I looked online last week to see how much it would cost to fly to Asia. 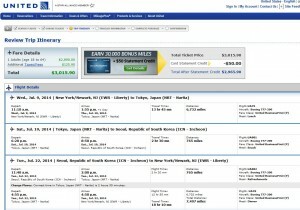 The pictures below show prices on United Airline’s website. The prices have not changed in a week so they are not a temporary mistake and the flights to/from Columbus Ohio are eliminated to make the problem clear. 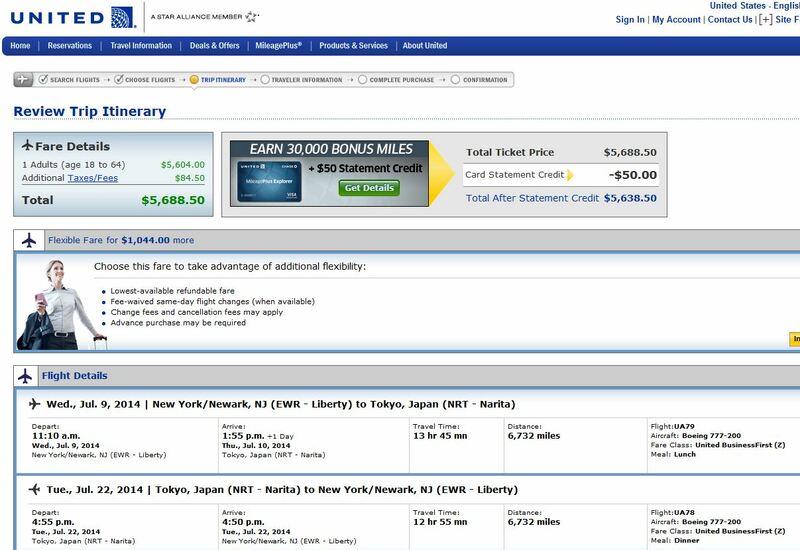 If you want to fly business class round-trip from New York to Tokyo (top picture) it will cost you almost $5,700. 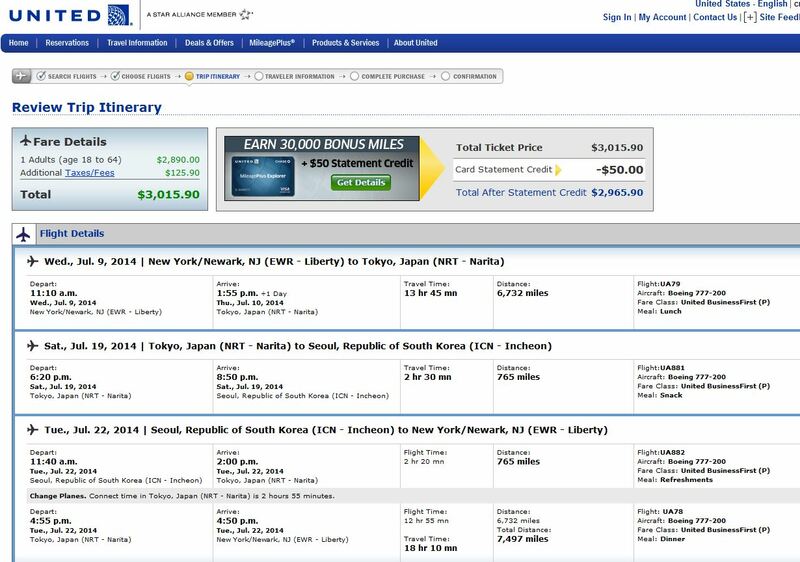 However, if you take the same flights BUT add on a side trip for a few days to Seoul, Korea the price drops to around $3,000 (bottom picture), reducing the price of your ticket by almost half. In most businesses, when things cost the company more, the end user pays more. The airline business seems to follow a different set of rules. Here, taking an extra flight, which costs United more money, means the end user pays less. This insanity is not limited to Asian flights. The same problem exists when trying to find a cheap flight to/from airports near Columbus, Ohio. It is often much cheaper to fly Dayton-Cleveland-New York than it is to fly Cleveland-New York. 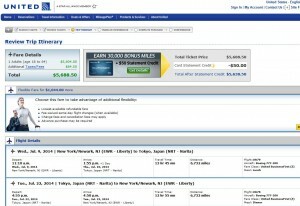 Do you have any ideas why airlines reduce the cost of a ticket even when you take more flights? The front page of both the NY Times and the Wall Street Journal today had articles about a 2 year old hi-tech company called Snapchat. The company was created by Evan Spiegel and Bobby Murphy, who met at a Stanford University fraternity. Snapchat was offered $3 billion cash to become part of Facebook. There are supposedly offers on the table from other people in the $4 billion range. Not bad for a company that has no profits! The offer got me thinking about the differences between when I graduated from college versus today’s graduates/dropouts. When I graduated about 30 years ago, almost no one thought about starting their own business. There was one person in my college class who created his own business during college. While he did quite well (a Porsche and his own house just off campus within 2 years), none of us thought this was the path of the future. Today when I look at my own students many of them are talking about setting up a company immediately after graduating or planning on working for someone until they raise enough money to start a company later. I have been thinking about the sharp difference in attitudes and believe one reason is that a small number of companies (like Snapchat) are given lottery like prizes for relatively few years of work. The headline popping numbers did not exist when I was a student so there was less incentive to start a company. Another important idea is that the cost of starting and running many businesses (especially hi-tech companies) has dramatically fallen. You don’t need to own your own servers, Amazon is happy to rent you space on theirs. You don’t need a large office. Many incubator spaces are willing to rent desk space by the foot. You don’t need a permanent support staff, outsourced talent around the world can handle customer support. Google is willing to handle advertising, cheaply and hyper-targeted. Lowering start-up and expansion costs increases the ability to become and succeed as an entrepreneur. The third reason is that feedback is much faster today than decades ago. If you have a business idea, you can quickly find out if it has traction. For example, you can put up a KickStarter campaign. If few people contribute to your KickStarter campaign then your idea for a business is dead in the water before you have wasted very much time. The faster you can figure out that an idea is good or bad, the easier it is to end up working on a business that is going somewhere. The final reason is that many of today’s entrepreneurs look like they are having fun. The company may or may not make it, but during its existence life is not all misery and work. I hope Snapchat succeeds, but even if they don’t I wish them a fun journey. Can you really tell expensive wine from cheap wine? A few days ago I invited my MBA students over to my house. At the party I served three kinds of wine (all California Cabs), three kinds of cheese (all sharp cheddar) and three kinds of chocolate (all dark). All nine items were served blind, which means the wines were in bags, the cheese cut in the same size blocks and the chocolate was served imprint side down. The question I posed to the group was could they really tell in a blind taste test which was the cheapest and which was the most expensive. The answers were interesting. The group overwhelmingly liked the $30 Cabernet compared to the $15 Cabernet and the $3 Cabernet. However, the clear favorite cheddar was the mid-priced Cabot cheese, not the organic cheddar. The least favorite chocolate was the fair trade, organic chocolate. More people liked the cheaper Hershey’s or the mid-priced Lindt. The results suggest some merit in Dan Ariely’s Wall St Journal article from a few days ago about how much you should spend on wine. He suggests many people cannot tell the difference between expensive foods and cheap foods. If you cannot tell the difference ordering cheaper wines/foods will save you money without diminishing the quality of your dining experience.